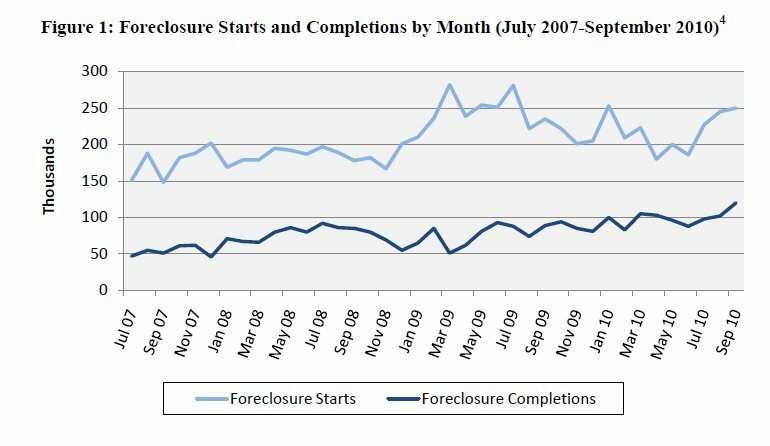 About a year ago I showed some data on foreclosure activity rates in the article Foreclosure Trend For Past 24 Months. But that data only showed foreclosure filings and didn't say how many of the foreclosures actually ended in people losing their homes. I found the chart below in a report from the Congressional Oversight Panel. The full report is available at the COP site. This picture is lifted right out of the COP report from page 9. I don't have more information on the data than that graph but you can get the basic idea from the chart. 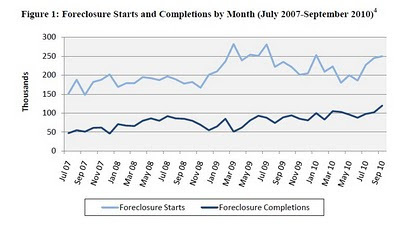 As you can see the number of foreclosures started in a month are much higher than the number closed. I take that to mean that most foreclosure proceedings don't end in actual foreclosure. People may pay the due amount or find alternative solution like a short sale. But this is mostly just my guess / assumption.